I love these books by Lauren Child. 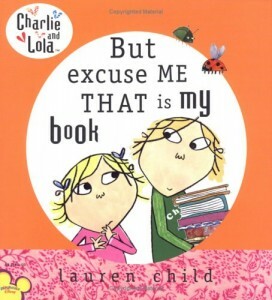 It is a great series about two siblings, Charlie (age 7) and Lola (age 4), and how they interact with each other. It is very English and charming, and the illustrations feel very satisfying and appropriate for the ages of Charlie and Lola. This title, But Excuse Me That Is My Book, is one I like to read to kids. Lola wants to check out her favorite book from the library, but someone else has checked it out instead.